Nearly 50 iconic historical and cultural sites across the Mediterranean are at risk of destruction in the next century, scientists show. 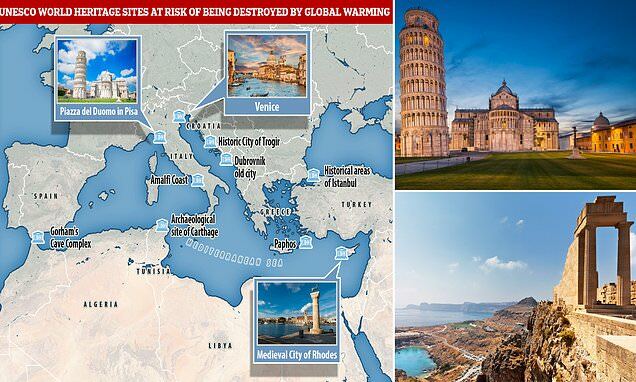 Rising sea levels are endangering the iconic Venetian lagoon as well as the Amalfi Coast, the Cypriot city of Paphos and Pisa's Piazza del Duomo. The UNESCO World Heritage Sites are close to coastal areas and at risk of severe flooding and coastal erosion, researchers said. The Mediterranean is home to a large number of historic sites due to the historical importance of the ports that populate the area. They found that of 49 coastal sites around the Mediterranean, only two will be immune from flooding or coastal erosion by 2100. The authors write in their study: 'As the risk of coastal hazards such as flooding and erosion increases with sea-level rise, a considerable number of coastal World Heritage Sites will gradually be exposed to these hazards in the future. The study considered this catastrophe to be a '100-year flood event', which is defined as an event which has a one per cent chance of happening in any given year. Piazza del Duomo in Pisa, the iconic cathedral that features the famed leaning tower of Pisa nearby, is the only site that is only at risk of flooding.